Compass Records and Larry Stephenson are making a special offer for his latest album, What Really Matters due out later this month -- May 29th. You can now pre-order the album, get free shipping and, the first 100 pre-orders will receive an autographed copy. 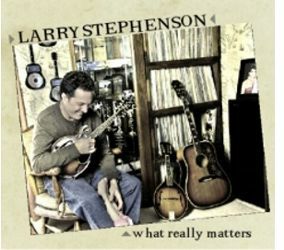 International Bluegrass Music Association (IBMA) award winner Larry Stephenson delivers one of the finest albums of his career on his Compass Records debut What Really Matters. The album comes on the heels of the Larry Stephenson Band’s win for Recorded Event of the Year at the 2010 International Bluegrass Music Awards for his bluegrass star-studded previous effort, 20th Anniversary, Stephenson again teaming up with co-producer Ben Surratt.